Encompassing the Sea of Japan coast, the Sikhote-Alin mountains, and the Khanka lowland, the Maritime Province represents a combination of mountains and plains with about three-quarters of the region being occupied by mountains. A major physical-geographical unit of the Maritime Province is the Sikhote-Alin mountainous system which extends along the Sea of Japan coast for 1100 km. Three major stages are identified in the geological history of the Sikhote-Alin-Sakhalin fold belt (Zonenshain et al., 1990). The first stage began in the late Paleozoic and continued throughout the Mesozoic. It includes the pre-flysh deformations which occurred in early Cretaceous time. The next, much shorter stage commenced thereafter and ended with the deformation of the Sikhote-Alin folded structures before the Senonian age of the late Cretaceous as the Sikhote-Alin island arc collided with the Amur Plate. The third stage (which is continuing) began at the end of the late Cretaceous when the continental margin affiliation of the Sikhote-Alin belt became established and the arc became a part of the newly constructed margin of Eurasia. High seismic activity is typical of the Sikhote-Alin with earthquakes reaching 8 points on the Richter scale. The average elevations in the Sikhote-Alin range between 800 and 1000 m and only two peaks (the Tardoky-Yany and Ко) exceed 2000 m. There is no clearly expressed axial ridge and the main watershed has approximately the same altitudes as its spurs. The Sikhote-Alin has an asymmetrical shape: the eastern macroslope is more steep, narrow, and dissected than the western one. The dome-shaped tops and convex upper slopes result in a landscape formed by eroded hills and steep alpine relief is almost absent. The Sikhote-Alin can be divided into two parts: the 200-250 km wide mountainous system and the adjacent approximately 60 km wide coastal section. Intensely dislocated Paleozoic clay shales, sandstones, and limestones are exposed in the axial zone while the periphery is formed by younger Mesozoic sandstones, aleurolites, claystones, and effus-ives and tuffs. High peaks are mostly associated with granite intrusions exposed by denudation. In the lower Pleistocene, extensive outpouring of andesitic-basaltic lavas took place. Thick deposits reaching 200-250 m occur on the interfluve of the middle Sikhote-Alin while in the upper course of the Ussuri these lavas form remarkably uniform and flat elevated plateaux. Typical of the Sikhote-Alin are intermountain depressions associated with ongoing subsidence and filled with sandy-clayey Neogene continental deposits. Despite modern tectonism, the contemporary denudation rates are relatively low because of the well-developed sod and vegetation cover. Only in those areas where vegetation has been degraded do slopes deteriorate significantly. Perhaps the most active modern relief-forming processes are those related to physical weathering in the upper mountains, which are devoid of vegetation, and to solifluction in areas of permafrost occurrence. Typical of the coastal section are Cenozoic lavas and tufts overlain by basalts. The mountains break off near the shore in cliffs and abrasion and abrasion-denudational forms, which coincide with faults, prevail in its northern part. Zones of abrasion are occasionally broken by mouths of the mountain rivers but because the Sikhote-Alin runs parallel to the shore northwards of the Bay of Olga, the coast is cliffed and there are few bays. Some of the existing ones have been formed from eroded volcanic calderas (Kaplin et al., 1991). By contrast, the southern segment has a typical ria coast. The mountain ranges run perpendicular to the coastline and numerous bays, deep estuaries, and islands have been created during marine transgressions. The formation of the contemporary coastline began in the late Pleistocene and since then the relative importance of abrasion and accumulation has been alternating (Korotky, 1988). Thus, during the latest interglacial, the sea level rose by 8-10 metres compared to the contemporary sea level and intensive coastal abrasion developed. During the last glaciation, extensive regression of the Sea of Japan took place with the sea level lowering by 110-130 m during the glacial maximum. The formation of marine terraces and intensive accumulation of slope sediments dates back to this period. The middle Holocene (5-2.5 Ka BP) was characterized by another transgression and the rise of sea level by 2-3 m compared to the present one which has led to the formation of the rias in the southern Maritime Province, development of the youngest abrasional segments, and transformation of denudation surfaces into abrasional coastal forms. At present, abrasion segments of the coast are relatively stable while the accumulation segments are being eroded because the sedimentation is weak. Another major unit is the Khanka lowland, a 100-120 km wide, low, and flat tectonic depression situated between the East Manchurian mountains and the Sikhote-Alin. The lowland developed during the Neogene-Quaternary when marine transgression, formation of lakes and slow river flows resulted in the accumulation of lacustrine and alluvial deposits and filling of the depression. Because of the continuing subsidence and poor drainage, ground water levels are high and the lowland is extensively swamped (Yarmolyuk, 1969). The large (4190 km2) but shallow (maximum depth llm) Lake Khanka occupies the central part of the lowland. A vast water body formed on the Khanka lowland in the Pliocene and the first lacustrine deposits date back to about 10 Ma BP. More recently (during the last million years) frequent and extensive oscillations in lake level and area have occurred and at present the lake level is known to oscillate every twenty six years (Vaskovsky, 1978). Located at the junction of four botanical regions, the Maritime Province is distinguished by a high biological diversity. The history of vegetation development and its diversity are best manifested in its complex composition distinguished by a combination of boreal, temperate, and subtropical species. Heat-loving elements of the Manchurian flora (various broad-leaved woody species and vines) have advanced to the region from the south reaching approximately to 50°N; species representative of the Okhotsk flora (e.g., Picea ajanensis) have migrated from the north; elements of the frost-resistant East Siberian flora (e.g., Larix gmelimi widespread in the northern Maritime Province) have arrived from the north-east; and the steppe Dahurian (Mongolian) species have penetrated from the Transbaikal region through the Khanka lowland. In contrast to many other regions, the Quaternary glaciation in the Maritime Province was limited to the high mountains and the evolution of biota has been continuous throughout the Neogene-Quaternary. Many warmth-loving Tertiary species (representatives of the Manchurian flora) have survived such as, for example, Phdlodendron amurense and Aralia mandshurica, while many boreal species invaded during the cold epochs (Kolesnikov, 1969). Further complexity arises from the climatic factor and topography: the Maritime Province encompasses three natural zones (dark taiga, mixed broad-leaved coniferous forests and forest-steppes also known as the Amur prairies) the continuity of which is disrupted by the influence of the ocean and mountainous relief. A combination of these factors have created a complex and unique biota which is distinguished by many endemics and does not have an analogue in the FSU (Ablaev, 1978). The most prominent zonal vegetation is the mixed broad-leaved coniferous forest of the Manchurian type which occurs on the plains of the southern Ussuri region and covers lower slopes in the southern Sikhote-Alin. Over 100 species are Tertiary relicts and endemics and the total number of woody plants exceeds 200 (Taiga dalnevostochnaya, 1986). The forests are polydominant and have a complex multitier structure. The first tier is composed of tall conifers which, being 250-300 years old, exceed 40 m in height and 200 cm in diameter. The most common species are Pinus koraiensis and Abies holophylla. A tier of deciduous trees, composed of Betula costata, Tilia amurensis, Ulmus montana var. heterophylla, Acer mono, and Jugltms mandshurica, develops below the canopy of conifers. A particularly valuable species is Phellodendron amurense which adapts easily to severe climatic conditions, is drought-resistant and can be cultivated in more northern regions. The third tier comprises Carpinus cordata, Tilia mandshurica, Acer mandshuricum, Primus maximowiczii, and Syringa amurensis while the undergrowth consists of many shrubs. Vines are abundant in the Manchurian forests, growing best in lighter habitats such as river banks and areas damaged by fire. The most common species are Vitis amurensis, Schisandra chinensis known for its strong lemon-like scent, the largest and most heat-loving vine Actinidia arguta, and the most abundant and northern-growing Actinidia kolomicta. On the well-drained southern slopes, dense Quercus mongolica-Pinus koraiensis-Betula dahurica forests develop as well as groves of Quercus mongolica which replace mixed communities destroyed by fire. Taxus cuspidata occurs in the southern Sikhote-Alin. The mixed and broad-leaved forests of the Maritime Province are also discussed in Mixed and Deciduous Forests section. The southernmost Maritime Province and the Khanka lowland are occupied by vegetation communities known as the East Asian savannahs or the Amur prairies (Kolesnikov, 1969). These resemble the chernozem steppes but the excess of summer moisture prevents the formation of chernozem and soils with a high content of humus (reaching 15 per cent) and traces of gleying develop instead. Three main types of vegetation occur in the Amur prairies: woodlands, meadow steppes, and wetlands. Most researchers believe that all these are primary communities the origin of which dates back to the middle Pleistocene. The modern distribution of vegetation communities is controlled by soil moisture which in turn depends on topography. Woodlands develop in well-drained elevated sites and slopes and are composed of adapted low growing Quercus mongolica and Betula dahurica with Corylus heterophylla and Lespedeza bicolor in the shrub tier and grapevines. Natural woodlands degraded by human activity are replaced by shrub thickets. Most of the interfluves are covered by meadow steppe communities whose distribution is clearly marked on the Khanka lowland. Cereal-grass meadows with scattered individual trees occupy drier parts of the plains and there are many Dahurian species in the driest slope habitats underlain by sand and gravel. Mixed-grass meadows dominate habitats with moderate moistening and reed grass meadows occur in moist but not permanently swamped sites. Highly productive fens, dominated by tall grasses and sedges, occupy low and wet habitats. The shores of Lake Khanka are largely swamped and vegetation here is formed by such species as Phalaris, Typha pallida, Scirpus, and Zizania latifolia and many warmth-loving aquatic plants (e.g., Euryaleferox and Salvinia natans). Lake Khanka is located on the migration route of many bird species. Its bird fauna includes more than 200 species and the lake is protected under the Ramsar convention. 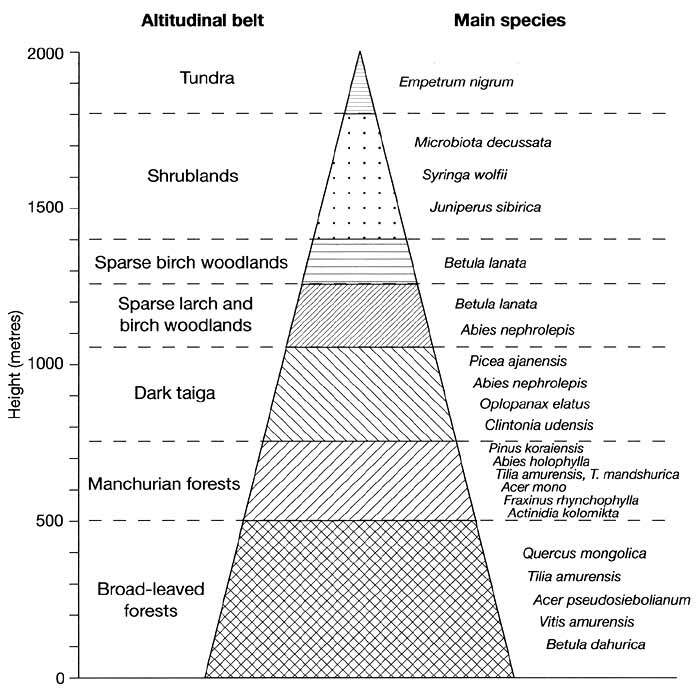 Altitudinal differentiation is well expressed in the distribution of vegetation in the Sikhote-Alin (Ogureeva, 1999). The southern Sikhote-Alin, where summers are long, warm, and humid, is distinguished by an intricate vertical zonality (Figure 18.2). The Manchurian forests occupy the foothills and lower mountains passing into the dark taiga which contains mainly Okhotsk species above 750 m. Close to the timber line, coniferous forests alternate with Betula lanata woodlands. Above 1400 m, these are succeeded by open landscapes where vegetation is represented by shrublands of Microbiota decussata and Pinus pumila alternating with mountainous tundra communities and bare rocks. The upper limit of the mixed forest belt lowers northwards and the composition of forests changes: while in the south most widespread are the mixed Abies holophylla broad-leaved and Pinus koraiensis-Carpinus cordata forests with vines, further north these grade into Pinus koraiensis broad-leaved and Picea ajanensis broad-leaved forests. North of 47° and 50°30' latitude on the eastern and western macroslopes respectively, these are almost completely replaced by the dark taiga dominated by Abies nephrolepis and Picea ajanensis. 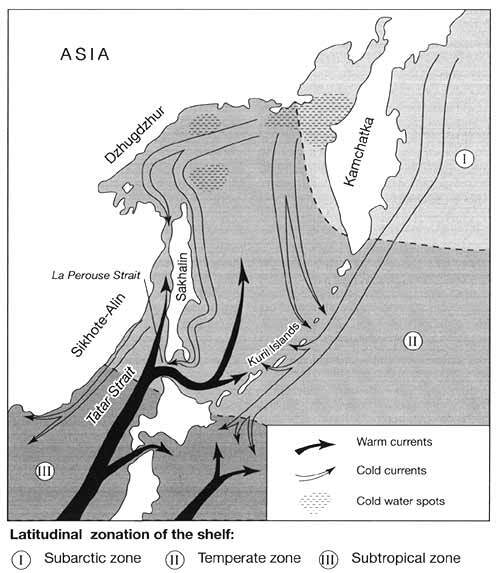 The asymmetry is related to the cold current flowing from the Sea of Okhotsk through the Tatar and La Perouse Straits (Figure 18.1) that pass close to the shore, reducing the water temperature by 10-11°C, which results in a cooler climate. Mixed forests, devoid of many southern species, do not form a continuous belt, developing only locally in favourable habitats. The floristic composition of the taiga is much poorer: total species number is small compared to the mixed forests and there is little undergrowth. Since the beginning of the 20th century it has been known that approximately every 25 years the Picea-Abies forests undergo severe degradation leading to the widespread death of forests (Manko, 1967; Kozin, 1986). Initially, this process affects mature uniform stands but it may later spread to younger trees. Although this is believed to be a part of the natural cycle of coniferous forest development and ageing, human activities often exacerbate its extent and intensity (Gladkova et al., 1993). The protective role of these forests is very important because soil cover in the northern Sikhote-Alin is thin and may be easily washed off by melt water and summer rains. The sparse Larix forests, similar to those of Eastern Siberia, develop in habitats underlain by permafrost. The continuity of evolution and a high diversity of habitats have resulted in a rich and unique fauna which includes both southern and boreal species. Of these the Amur tiger, which inhabits the mixed forests, attracts most interest. Due to overhunting, tigers nearly disappeared in the 1930s-1940s, when their population was reduced to about 40 individuals and only strict conservation measures have allowed them to increase their number to about 400 (se below; Strategy for Conservation, 1996). At present, natural conditions of the Far East do not limit the development of this species and the only negative factors are poaching aimed directly at the Amur tiger and ungulates forming its trophic base, and the destruction of habitats through deforestation. The degree of anthropogenic pressure varies across the Maritime Province and while some areas, such as sections of valuable forests in the Sikhote-Alin, are conserved, other regions experience considerable human pressure. The main activities damaging the environment are timber logging, mining, and agriculture. The most impacted area is the southern coast of the Sea of Japan, where the large ports of Vladivostok and Nakhodka are located and polymetallic deposits are developed, and the lowlands of the southern Maritime Province, which are important agricultural regions. Although arable land constitutes only 10 per cent of the total Maritime Province area, 40 per cent of the Khanka lowland is cultivated. The direct withdrawal of land for agriculture, land reclamation, and water pollution cause degradation of Lake Khanka's environment and threaten its wildlife (Bogatov, 1996). However, it is deforestation that is most damaging to ecosystems in general and biological diversity in particular. Commercial logging peaked in the early 1990s when about 8 million m3a-1 of coniferous forest was cut in the Sikhote-Alin leading to a 70 per cent reduction in the area of cedar forests in comparison to the 1920s (Dolgovremennaya progmmma, 1992). Although the affected territory is not large in comparison with the total forested area of the Maritime Province (75 per cent of which is forested), the extraction of valuable species as well as the use of degrading methods (see below) have lowered the capacity of forests for natural regeneration and changed the composition of forests dramatically. In particular, clear felling, which is commonly used, has led to the replacement of primary forests with Ouercus mongolica and Lespedeza bicolor shrublands which have spread across the foothills and lower mountains forming locally a continuous vegetation belt (Figure 18.2). The need for protection of forests and wildlife is widely recognized both by Russian and international conservation bodies and at present there are eight nature reserves in the Maritime Province. One of them, the Sikhote-Alin, has the status of a biospheric reserve and is included in the UNESCO World Nature Heritage List. Protected areas occupy 7 per cent of the total territory and an expansion to 15 per cent is planned by 2005 so that various habitats are included and a general ecological balance is sustained (Dolgovremennaya programma, 1992).